Foresta is my first forest map, the map itself was made to make multitask and harass as important as posible, while maintaining a standard layout, the map will reward the player that has the most active style of harass, but since there are big wide and clear paths to the enemy there will be big battles fought over. Zeara District brings the beauty of the light bridges that Cloud Atlas had but disgregating his pasive games. This map was design with tactics and complex strategies in mind while maintaining the simplest posible layout. The map will play as a solid map while maintaining a healthy amount of rush and non standard play, the map has many drop pods which are highlighted by yellow. I really like the aesthetics and the map layouts look solid too. I've had a quick play on both of these and I like them as much, if not more, than the last bunch of your maps. Foresta's aesthetic reminds me a little bit of Command & Conquer and Red Alert's forest maps, which is a good thing. Foresta is simply gorgeous. I worry about the rush distance. It seems like an improved Whirlwind. About the rush distances, in cross spawns is slightly longer (since the units need to walk around the center in my map, meanwhile in whirlwind the units walk straight to the enemy base), but in vertical/horizontal spawns the rush distance is shorter by a considerable amount, so when you send your scouting probe and you don't find you oponent in the first horizontal/vertical base you scout, you should still be able to scout faster than you would do on whirlwind. 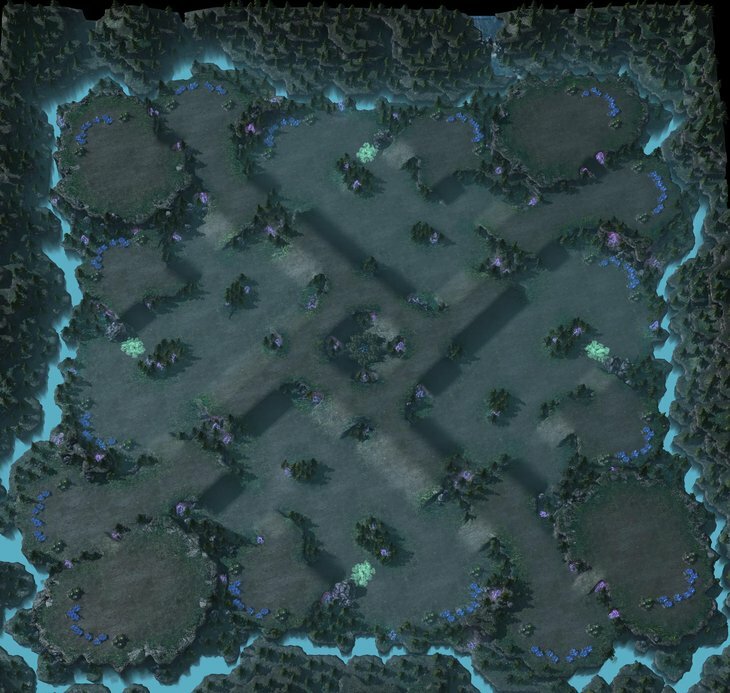 What i mean is that this map is scouted faster than whirlwind even if it has a longer cross spawns distance than whirwind itself. District is really cool. Also the corner highgrounds are pretty cute. 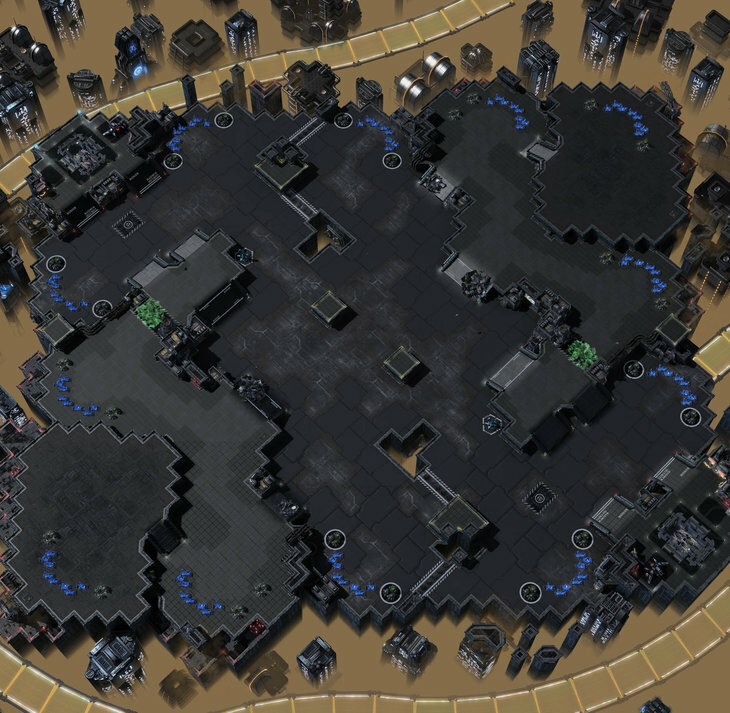 One thing i forgot to mention is that the empty areas of the corners of the map are buildable, so the players can hide buildings there, in one of the testing games i saw a ~diamond tester float a factory there and start building alot of widowmines to then grab two medivacs fill them up with the widow mines and then drop the mines into the Protoss player mineral lines... it was awesome.